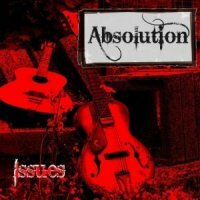 Absolution is a blues rock power trio relatively new to the scene, forming in 2010 and ‘Issues’ is their debut album. Going for an old school approach of cutting a record raw, the band wrote it in five months and recorded it in a mere five days. That’s all well and good, but it wouldn’t mean much if the final product was poor. ‘Train Ride’ is a plodding start with a crunching riff and heavy, pounding beat. Guitarist and singer Joe Fawcett has a pleasant, if unremarkable voice and the track is decent, but lumbering. I think a better choice for opener would have been the more energetic ‘Blind Man Crying’ which is a stronger song overall. ‘She Got The Money’ treads the traditional blues-rock path without ever looking like breaking new ground. The sound is very sparse with the band being a trio – to me it sounds a little too sparse compared to the sound of three pieces like the legendary Trapeze or award winning new-comers Tracer. ‘Broken Man’ is forgettable while ‘Don’t You Love Me’ tries to up the ante with a strong bluesy riff, but the chorus segment sounds rather flat. The dour ‘Cross The Void’ has some organ work which helps the band’s otherwise scant sound immeasurably. Cutting the album quickly means the songs will be replicated live with ease, but personally I feel a few additional instruments or backing vocals on the finished album would make for a better record with a fuller sound – my personal preference may well not mesh with the band’s vision, but my job is to call it as I see it. For a debut album, I can’t give it too much stick – the band have written it all themselves, no covers. The production of the record is good, however I think the songs are mostly average. There’s nothing I would class as bad, but for all the decent riffs there’s nothing that really stayed with me, due to many of the songs staying within the generic blues rock guidelines. Not bad for a first effort, but far from essential listening.